Golden Lotus Chinese Restaurant is an elegantly-appointed dining venue serving the finest Cantonese, Szechuan cuisines and Dim Sum lunches. Located adjacent to the Main Lobby of Bali Dynasty Resort, it is open 6 days a week from Tuesday until Sunday for Lunch from 11.30am to 2.30pm and Dinner from 6pm to 10pm. 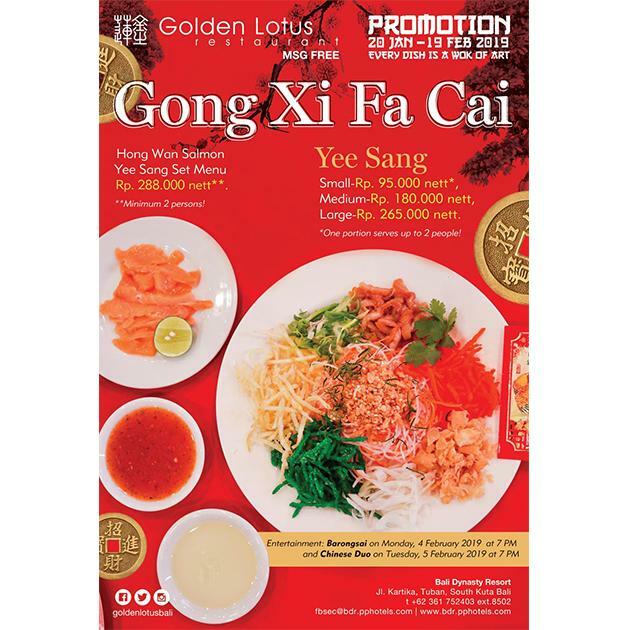 Having won numerous awards as the best Chinese Restaurant in Bali, Golden Lotus proudly presents authentic Chinese cuisine that is completely MSG Free. For reservations please call (+62 361) 752403 Ext.8502 or email fbsales@bdr.pphotels.com .